A little over a week ago, Kirk Wilder officially opened Acme Floral Co. in the former Verde SF space at 1265 Fell St. (between Broderick and Divisadero). 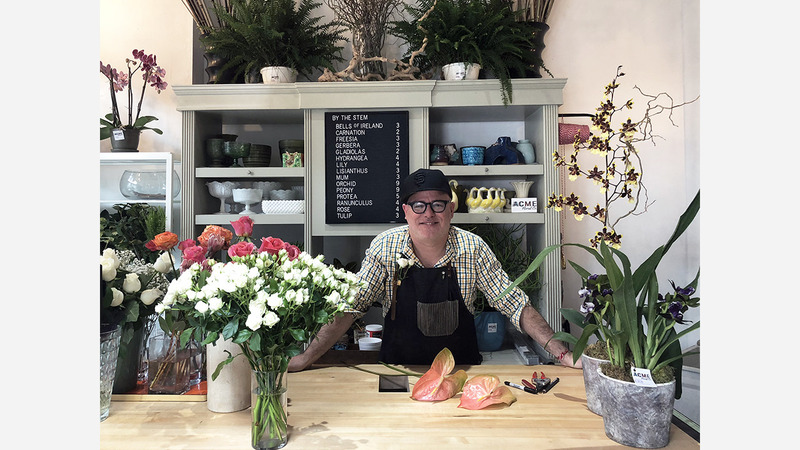 After operating his floral business out of his Lower Haight home for about three years, he visualized moving his retail operation into a similar space, he told Hoodline. "I could smell and see it," he said. Wilder said he noticed the space was for rent when he saw a sign in the window. After signing the lease, he made the storefront over with fresh paint, new flooring and lighting, along with new shelves and a modified work table. Organizing the space was a fun task, said Wilder, who compared it to a boat, where everything has an assigned location for easy reference. "Most people can't believe that it already looks so complete," he said. In addition to retail sales, Wilder also provides flowers to private residences and offices in San Francisco. Each morning, he starts his day at SF Flower Mart. "It's an honor to do people's flowers," he said. Wilder said his classic arrangements would be damaged if they were delivered via bicycle, which is why he uses his hybrid car to make deliveries. In his shop, customers can select arrangements with orchids, succulents and other plants that start at $50. Wilder also sells pots and vases collected from flea markets and yard sales in San Francisco and across the state. Early next month, Wilder said he plans to commemorate the grand opening with a party at his shop. "There will be a food truck," he said. Acme Floral Co. (415-735-5265) is open Monday to Saturday from 11am to 6pm, but Wilder said his hours are flexible because he does a lot of deliveries himself. To make sure he's in, he encourages customers to call ahead. Thanks to tipster Kim Q.! Have you come across a new business in the neighborhood? Text your tip and a photo to 415-200-3233, or email tips@hoodline.com. If we use your info in a story, we'll give you credit.